Huntsville is known as the Rocket City because the aerospace industry that has made its home here for the last several decades. Huntsville is at the forefront of research and technology with biotech firms setting up in our business-friendly environment. The United States Army also established a large base at Redstone Arsenal that is in use even to this day. In the city that is known for many different industries, there is one more to add to the list: appliance repairs. 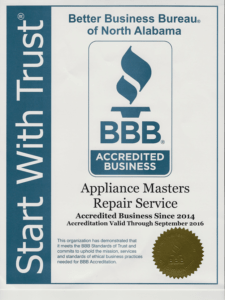 Appliance Masters Repair Service offers citizens the opportunity to have their appliances serviced by a local professional technician with decades of service and experience in every brand, model, and make of home appliances. What makes us so unique? Why do the people of Madison County continue to make us their first call for appliance repairs? People rely on us because of the recommendations from customers who have used us in the past. Our technicians work to provide a quality repair on all makes and models. Maytag washer repairs, Samsung dryer repairs and GE repairs are all part of the spectrum of appliances we service. We don’t stop at simply repairing home appliances; we are also Huntsville’s first choice for an appliance installer. Customers call us from Gurley, New Market, and Triana to perform new installations on their home appliances. We receive calls from all across the county because the word has spread that our services are unmatched by any other appliance repair service. Our low prices stay low because we believe the people of Huntsville deserve more value for their dollar. That’s why we cap our service charge at $60 across all of Madison County, regardless of the time you call. From Monday to Sunday, 9 a.m. – 9 p.m., our prices remain the same. People have heard about this fair pricing structure and they have spread the news. Because of our extensive knowledge in every major brand and model of home appliance, we confidently offer you a guarantee on the parts and labor for the services we perform. If we complete a tumble dryer repair, we back it up. If you ask for a dishwasher fix, we can guarantee that as well. If you have a refrigerator repair that’s especially difficult, we’re happy to offer you complete assurance in the parts and labor of the service. Our qualified technicians have all the qualifications to offer you the most trusted quality repair you will find. Huntsville has made its choice, and its homeowners have chosen to call us at Appliance Masters Repair Service for all of their affordable appliance repair needs. Find out why your neighbors have been using us for years. Whether you live in Harvest, Hazel Green or Moore’s Mill, call us today for simply the best appliance repair service you will find in the entire county.